There is a reason why scholarships often come with a stipend. A government scholarship after all is an investment made by the public on a promising student. These awards are meant to support the student in every possible way. Without a stipend, a student may not be able to concentrate on his or her studies if such student is still forced to earn a living. Therefore, it goes without saying that the recipients will rely on this stipend to meet their basic needs. After all, it is not a "luxury allowance" but a "living allowance". When I started college, I was rudely awakened to bureaucratic incompetence. As a scholar, I was counting on the monthly allowance for my daily expenses. But months after the first day of school, there was no sign of such an allowance. It was delayed. Without a living wage and a stipend, it is no wonder that some bright people still find themselves buried in debt. With the transition to the new K+12 curriculum in the Philippines, teachers in colleges have found their jobs in peril because of the low enrollment. High school students are now spending two more years before entering college. To help these teachers during the transition, the country's Commission on Higher Education (CHED) now provides scholarships so that college teachers can begin working on their graduate degrees at this idle time. These scholarships will likewise address the lack of graduate degrees among instructors in higher education. These teachers obviously are a bit different from my situation when I was a college student. These teachers are very much likely breadwinners. Sadly, things have not changed. Similar to my time, their allowances are also delayed. Acknowledging that these delays can cause inconvenience highlights a gross lack of awareness of how important these allowances are and how urgent it is to release these funds on time. This allowance is a lifeline. CHED shares information on these programs through a blog on WordPress. 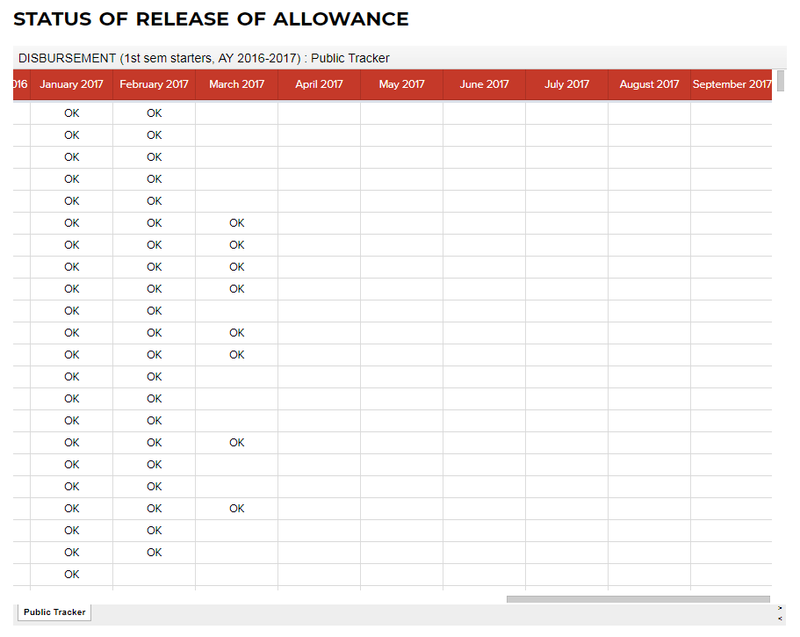 From that blog, it can be seen that for most of the 4000 recipients, allowances as far back as March of this year have not been released. I am sharing here a couple of posts on Facebook from scholars that are suffering from this gross negligence and incompetence. Not having a living allowance for the past seven months (more than half a year) is truly oppressive. Nag-December na lang, Wala gihapon. So I’m posting this again. 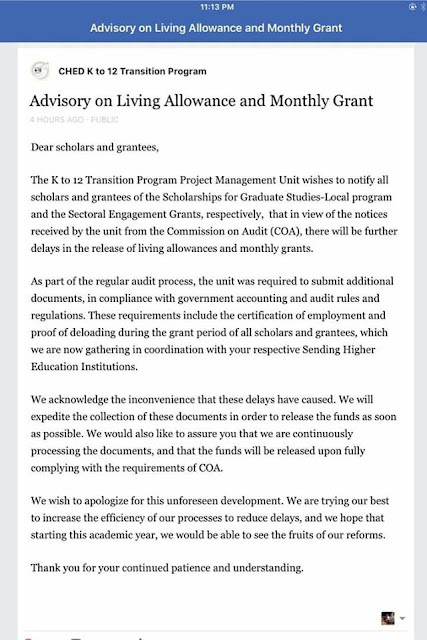 While this advisory informs us, your scholars, of the further delay in the disbursement of our living allowance, this does not cancel your gross incompetence as an agency. You said you apologize for this unforeseen development, but that does not reduce our anxiety as we try to survive our everyday lives as graduate students away from our families and loved ones. You said you are trying your best, but you can't even provide us exact dates when you would finally solve all of these inconsistencies. I refuse to believe that CHED is an inefficient agency, nor do I think it is corrupt. However, with the way things are going for us scholars, we cannot help but question this very Institution whose mandate is to uphold reforms in higher education. With the delays of delivering our allowances, we cannot help but doubt if the K to 12 Transition Program is indeed the right program which promised to help displaced teachers get the degrees required so that they could effectively teach again and teach more in their respective institutions with no fear of demotion or removal from their teaching posts. We are doing our part as scholars by doing well in our studies. We always submit our documents on time. We made sure to give the necessary requirements to you even before we started schooling. The double bind with our contract as scholars is that we will be compelled to pay back the allowances we received should we fail in our courses. But how are we supposed to focus on our studies when we are hungry and/or are about to be kicked out from our boarding houses and dormitories because we couldn't pay our dues on time? How are we supposed to give our best when we are demoralized, and our dignity broken? The delay is unbearable as it is oppressive. We are scholars, yet we feel like beggars. Please release the delayed allowances now. It has been SEVEN months already. We are teachers. But more than that, we are wives, husbands, fathers, mothers, daughters, sons, friends, sisters, brothers, human beings. You have tried to reduce us into insignificance for the last time. This is a warning. Make no mistake. You will pay for your gross negligence of duty, and inhumanity. So much talk about human rights violations in this country. CHED scholars have been kicked out of boarding houses, have been getting stressed out of their wits' ends... and could you imagine the talks in families where for 8 months, the financial strain has mounted, and without hope of resolution? What kind of monsters are you? You looked my boss, straight in the eye and told him we will get our LIVING allowances before this year closes. We have not received a cent since we started studying here, and we are now about to go home for term end. So imagine our shock earlier when DBP informed me and my friend you have not endorsed our names yet, and we don't even have bank accounts. We have submitted all our requirements for the SECOND time last October. And we did not ASK to study here. You deceived our Institutions into sending us HERE in Manila where a kilo of my favorite orange camote is 174 pesos! I had to defer because it was a struggle for me to leave my home, my family, debate, teaching, my boyfriend, my friends... Everything I've known and loved. Yep. I am FURIOUS. And trust me, you WILL NOT get away with this. If I weren't a teacher from one of the best universities in this country, I'd say F U. You have made your last excuse. How inefficient the administration is in releasing these allowances is truly in stark contrast on how quickly the past administration of Aquino managed to release funds for the highly questionable dengue vaccine. 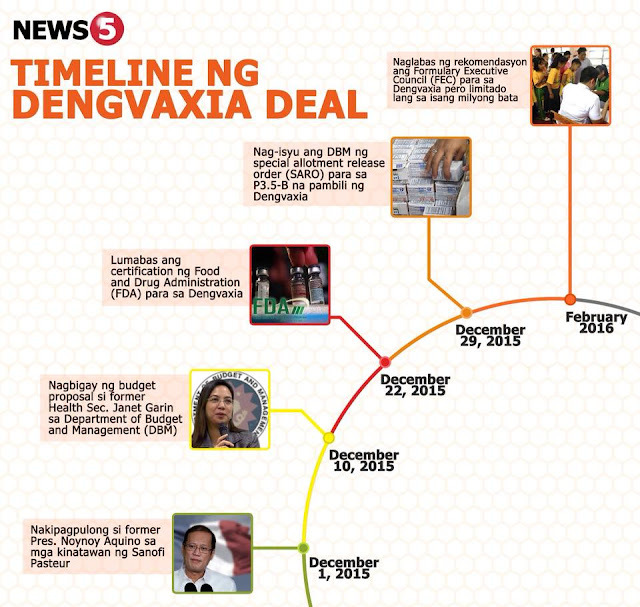 The past Aquino administration could indeed execute. The makeup of the Commission on Higher Education is still largely from this past administration, yet this commission seems to be an exception when it comes to timely action. Perhaps, what makes this an exception is the fact that scholarships are really meant to help people while the vaccine maybe important for a more urgent reason for Aquino other than the well-being of the Filipino people.